Atturo offers a selection of high quality accessories to complement our range of tires. We strive to provide great value in these items with unique designs and durable materials. * New Carbon Fiber Bottle Opener based on the Trail Blade BOSS Knife* Magnetic backing to stay mounted on your fridge, or cooler* Embedded touches of green detail throughout* Very comfortable to hold*..
Atturo Trail Blade BOSS 1.9" RC tire* Advanced X2 SS Compound (Super Soft & Sticky)* Fits: 1.9" Wheels* Overall Diameter: 4.25in / 108mm* Width: 1.5in / 38mm* Inner Diameter: 1.9in / 48mm* Single ..
Atturo Trail Blade M/T 1.9" RC tire* Advanced X2 SS Compound (Super Soft & Sticky)* Fits: 1.9" Wheels* Overall Diameter: 4.25in / 108mm* Width: 1.73in / 44mm* Inner Diameter: 1.9in / 48mm* Single ..
Atturo Trail Blade X/T 1.9" RC tire* Advanced X2 SS Compound (Super Soft & Sticky)* Fits: 1.9" Wheels* Overall Diameter: 4.25in / 108mm* Width: 1.375in / 35mm* Inner Diameter: 1.9in / 48mm* Single.. The Cantu Bruner Designs PENDEMIC edition pen is constructed of two once-fired .308 shell casings. 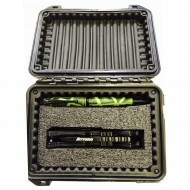 The cases are custom machined and then finished in a zombie green cerakote with black spray ove..
FEBRUARY SPECIAL - The combo case is a pairing of the QTR3-XT knife and Cantubruner Pendemic pen, both exclusive to Atturo Gear. These friends are housed inside a padded hard case with cust..